Knowing how to make pizza from scratch isn’t rocket science! So, why do so many people dish out a lot of dough for pizza delivery? Of course, it’s all about convenience. 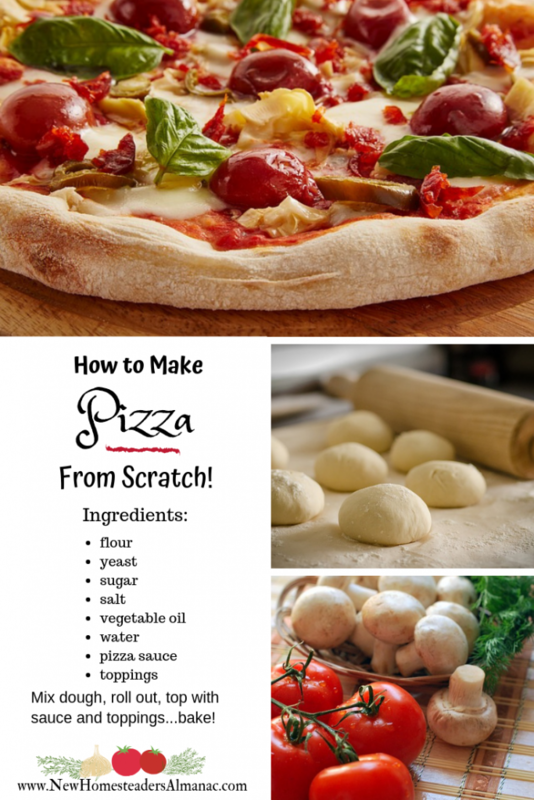 With these instructions you can make your own pizzas from scratch with just a few ingredients. Have a family pizza night or make crusts to freeze and bake when you need an easy meal! Pizza Even Has Its Own Day! When surveyed, 15% ofAmericans listed pizza as their favorite comfort food (higher than any other comfort food!). It’s also considered the ‘most addictive’ food and the world’s ‘most-Instagrammed’ food. * There’s an entire business based on delivering its cheesey goodness to homes around the country. We love pizza so much, we even gave it its own day…February 9th is National Pizza Day! So why not celebrate with your own home-baked pizzas? Pizza From Scratch Delivers Great Taste! Not only does homemade pizza taste wonderful, but you also have control over the ingredients. You can make a veggie pizza with less cheese if you’d like to go a little light on the fat and calories. Replace the pizza sauce with pesto, or skip the sauce altogether. You can use minced garlic in olive oil in place of the sauce…top your pizza just the way you like it! Raise your own ingredients for homemade pizza! Some of us don’t live close enough to a pizza delivery place to take advantage of this convenience. And even if you have a pizza shop right down the road, it gets pretty pricey to order out. One pizza can run $12 and up, so making your own really saves a lot of money. Grow your own tomatoes, garlic, peppers, onions, and other toppings in the garden for extra savings. Maybe you have your own dairy animals to make mozzerella…homesteaders can save a lot of dough if they raise and grind their own wheat for the flour for the pizza crust! You can learn to make more of your food from whole ingredients from a local farmers market. Making your pizza from scratch gives the whole family a chance to pitch in and learn cooking skills! Use a pizza stone in place of the cookie sheets for an extra crispy crust. If you like a thick crust, don’t roll the dough out as thin. A cast iron pizza pan with olive oil makes a deliciously crispy crust that tastes like a famous chain pizzeria pie. Homemade pizzas from scratch are easy to make! Mix 1 cup flour, yeast, sugar, and salt in mixing bowl. Heat water to 120 – 130 degrees F in microwave or sauce pan. Add water and vegetable oil to dry ingredients and stir until combined. Add the rest of the flour, a little at a time, stirring to combine, until it is difficult to stir with spoon. Turn dough out onto floured surface and knead to incorporate the remainder of the flour. Dough should not be sticky, add a little more flour if necessary. Knead dough until smooth and elastic. Cover and allow to rest for 10 minutes. Sprinkle corn meal on greased cookie sheets or pizza pans and set aside. Divide dought in half and form into balls. Using hands or a rolling pin, roll dough out on floured surface until about 1 – 2″ thick. Place on pan. Repeat with second ball. Spread pizza sauce, minced garlic in olive oil, or pesto on crusts. Sprinkle with pizza seasoning and top with your choice of toppings and shredded cheese. Bake pizzas for 20 – 30 minutes or until crust is browned and cheese is melted. Test center to make sure dough is cooked through. Allow to cool for 5 to 10 minutes and slice. For whole wheat pizza crusts, replace 1 cup of unbleached flour with whole wheat flour. Do you like the convenience of frozen pizza crusts? It’s easy to freeze these and thaw later…you just need some extra space in the freezer for the odd size. Roll the dough out, place on floured pan, place pan in the freezer until crust is solid. Place frozen crust in large plastic freezer bag and store in freezer. Use in 3 to 4 months for best results. To use your frozen crust, remove from freezer, place on greased cookie sheet with a sprinkle of cornmeal or flour to prevent sticking. Cover and set in a warm spot while you prepare your toppings. You do not need to thaw completely before adding the toppings and placing in the oven. Bake at 400 F for 25 to 40 minutes, or until crust is browned and pizza is done in the center. Not much room in the freezer? Divide the dough into 4 or 6 balls and make small pizzas. Make up your pizzas with toppings ahead of time and freeze for an easy meal…use in 2 to 3 months for best results.